So you think you're into geek musicians? Well, if you don't 'get' the above reference, then you're Johnny Wannabe. Move aside, Coulton! Back of the bus, Paul and Storm! Edric Haleen is a brilliant musician whose work shows influences from Sondheim to Tom Lehrer, with a few stops in-between. 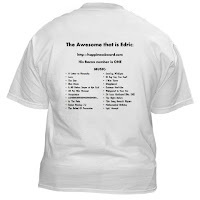 Those of us who have participated in or followed the Song Fu or SpinTunes songwriting competitions know Edric well as someone who's sure to wow the crowd with a show-stopper. And so what if he never wins? That's only because his music is over the heads of the Neanderthal judges. It's probably over YOUR head, too. I was discussing this in chat with some fellow musicians, and it occurred to us that anybody so infuriatingly talented... so impossibly intelligent... and so disgustingly pleasant... deserves his own merchandise. So I set out immediately to remedy that injustice. So here it is... 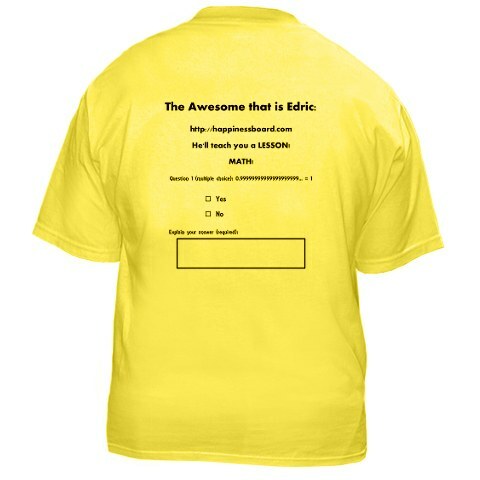 The EDRIC HALEEN FANBOY T-SHIRT! click on the images to supersize them. 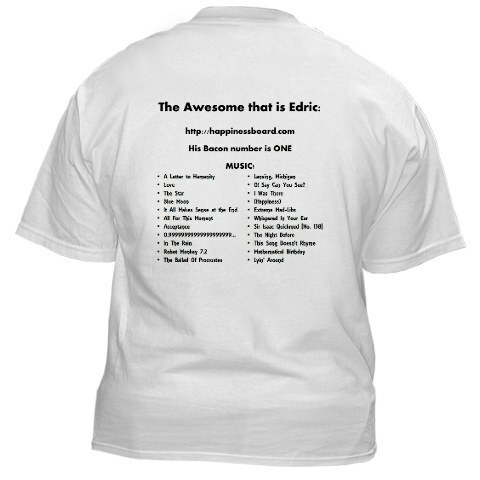 Look folks, you can't BE Edric. But at least you can admire him. * Edric is currently busy music-directing a show by Adam Gwon called Ordinary Days. The show runs from January 27 - February 5 in Lansing, Michigan, which means you might still have a few days to get your shirt before he notices he has a fan club. 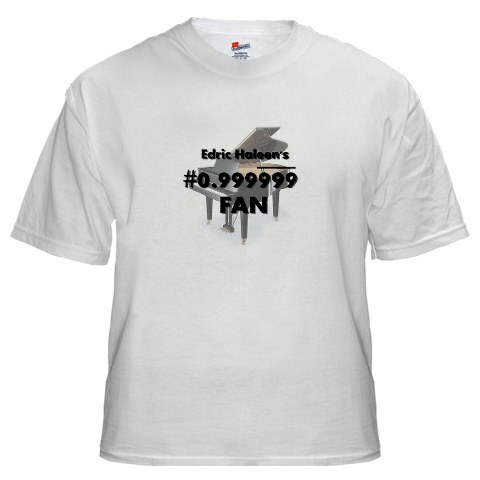 Due to popular demand (that would be JoAnn's demand), I've added the MATH QUIZ version of this shirt. to the store. 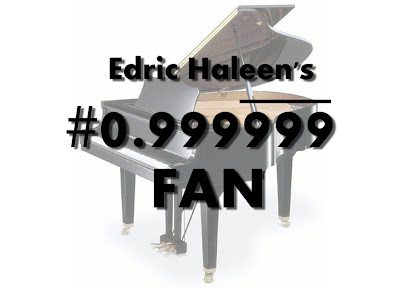 Now's your chance to weigh in on one of the more important issues of our age... does 0.9999999999... equal 1? Well.... does it? This is a True/False test presented as multiple choice for those who like to sit on the fence (or are simply partial to fuzzy logic). 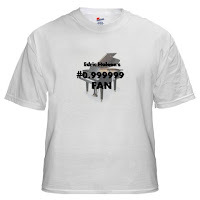 So buy the shirt, use a Sharpie to answer the quiz, and don't forget to show your work! Now here's the really AMAZING part of this product... If you happen to be in or near Lansing, Michigan, you can answer the quiz, explain your answer, and then stop by and have Edric himself grade your work! Right there on the shirt! Is that cool or WHAT?!? I like. I Like lots. In fact, it's going to be my 1000th tweet. Feel honored. Uh-oh, he found out already. Darn you Edric Haleen! Next, Mercury will have her own merchandise as well! @Edric, you are indeed Element #0.9999... on the Periodic Table of Geek Musicians. I'll also mention here that I didn't expect the shirts to actually sell, but since they are, all of the profits will go to the Rite Care Centers for Childhood Language Disorders. They provide professional speech and language therapy to children at no cost to the families, their insurance companies, or the government. Every little bit helps.